Parliamentarians have launched a bill aimed at tackling the growing problem of obesity in Russia. Inspired by the success of similar anti-smoking campaigns in forcing manufacturers to display warnings on packaging, the initiative is targeted at large fast-food chains such as McDonald’s and Burger King. Fast-food packaging in Russia may soon carry graphic pictures of overweight people with captions warning against the negative side effects of obesity, following an initiative from members of the lower chamber of the Russian parliament. A bill containing amendments to the federal laws on advertising and consumer rights protection is being developed by State Duma deputy speaker and head of the supreme council of the Liberal Democratic Party of Russia (LDPR) Igor Lebedev and his fellow faction members Yaroslav Nilov and Andrei Sivtsov. The creators of the bill have been inspired by a similar anti-smoking drive, as cigarette packs in many countries now carry picture warnings of rotten teeth or diseased lungs. Under the proposed bill, owners of fast-food chains will have to mark their packaging with warnings that excessive and frequent consumption of fast food is harmful to one's health. "The situation here is similar to the one with cigarettes: Consumers should be warned of the dangers posed by fast food. That means that fast-food advertising and packaging should carry the relevant information,” says a statement posted on the LDPR website. The MPs' proposal follows a warning issued to McDonald's in late June by the Russian consumer rights watchdog over the quality of the American franchise’s hamburgers. Russian State Duma deputies subsequently proposed checking other fast-food chains operating in Russia, including KFC and Burger King. 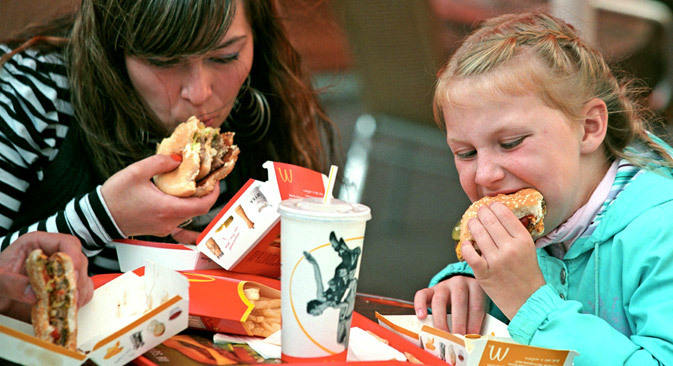 In a separate development, the Nizhny Novgorod Region branch of the Rospotrebnadzor consumer rights protection watchdog filed a lawsuit with Moscow's Tverskoi district court to oblige McDonald's to provide genuine nutritional facts about its food. Officials suspect the popular fast-food chain of understating the calorific value of its products. However, McDonald’s has defended its policy, with its Russian press service insisting that the company “calculates calorific value on the basis of methods approved by the Institute of Nutrition under the Russian Academy of Sciences." The lawsuit is scheduled to be heard later this month. Russians are indeed facing problems with obesity. "Russians' body mass has been on the rise for the past 20 years. This has been confirmed by research. In addition, doctors are recording a growing number of obese people during regular medical checkups," says Kirill Danishevsky, professor at the department of health care management and economics of the Higher School of Economics and PhD in Medicine. However, Danishevsky does not believe that the fault lies exclusively with fast-food restaurants. "It is, of course, not just the burgers that are to blame. The problem is that the overall food consumption model has changed," the expert explains. According to him, in Soviet times there were shortages of meat, so people ate more vegetables and fruit. In addition, food in the USSR contained fewer chemical additives. "When food shortages became a thing of the past, people were able to eat everything. At the same time the amount of calories in foodstuffs has increased," Danishevsky explains. Also, as more people in Russia could afford to buy a car, the amount of physical exercise and activity went down, with manual labor becoming less frequent too. As a result, Russians as a whole have become overweight. "In Soviet years, the problem of obesity usually affected women over 45-50. Now the age threshold has dropped significantly. There are overweight people among both men and women, starting from the age of 20,” says Danishevsky. According to the professor, “In particular, we have caught up and overtaken the U.S. for obesity in women over 30. We have fewer cases of extreme obesity, but there are overweight women starting from the age of 30 onwards. Many men have so-called beer bellies although they are caused not by beer alone. So, as you see, the problem is not just in hamburgers but in eating habits and lack of exercise," says Danishevsky. According to the World Health Organization, 59.8 percent of adult Russians are overweight and risk obesity, indicating a crisis in the nation's state of health. In a study published in British newspaper The Daily Telegraph, experts from the Harvard Business School have ranked Russia fifth in terms of obesity rates, based on more than 50 separate sets of figures from bodies such as the World Health Organization. According to the study, 24.9 percent of Russians are classified as overweight. The findings corroborate those published in 2012 in a separate study carried out by the Russian Academy of Sciences. The Harvard researchers attribute the trend to an unbalanced diet: An average Russian eats too many animal fats, red meat, sausages and butter and too little fruit and vegetables. The idea of informing consumers about exactly how healthy or harmful food on supermarket shelves has been voiced before, but the last attempt to raise the issue resulted in a compromise: It was proposed not to scare consumers with shocking pictures but to provide them with fuller and more accurate data so that they could make a better informed choice of what to buy and what to eat. Experts from the Healthy Food national research center, founded by Moscow State University professor Oleg Medvedev, call for increasing the size of the font that nutritional information is printed on food packaging to 12 points and devoting at least half of all packaging space to information about the ingredients. In addition, they propose including guideline daily amounts for different nutrients as a percentage of the recommended daily norm of 2,000 kcal. Energy values should be given not only per 100 g, as they are now, but for a portion or a whole package of the product, since consumers seldom notice that the calorific values listed on a food label refer just to 100 g of the product. Experts also urge manufacturers to supply a full list and percentage of the main nutrients and to publish information on potentially harmful ingredients, like saturated fats, cholesterol, trans fats, salt and sugar, on the front of packages.